Heat water and broth in a 2-quart saucepan over medium heat until it comes to a simmer. Reduce heat to low and keep warm. meanwhile, melt 2 tablespoons butter in large saucepan over medium heat; add salt, pepper, and broccoli. cook until tender crisp. remove broccoli from pan and set aside. In the same saucepan, add 1 tablespoon of butter, garlic, and onion. Cook until onion is soft. Add rice and stir for 2-3 minutes. Add wine and stir until absorbed. Increased heat to medium-high; stir in 1 cup of water-broth mixture until liquid is absorbed. Continue stirring and adding remaining water-broth mixture 1 cup at a time allowing each cup to be absorbed before adding another . 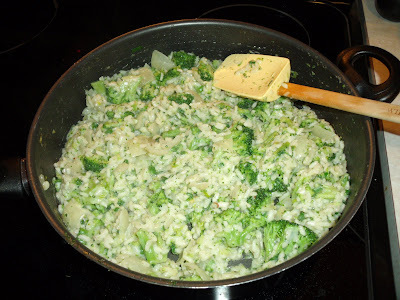 Cook until rice is tender ad mixture has a creamy consistency (approximately 25-30 minutes). Stire in asparagus, green onion, cream, and cheese. Stir until mixture is creamy, about 2-3 minutes. Serve immediately.